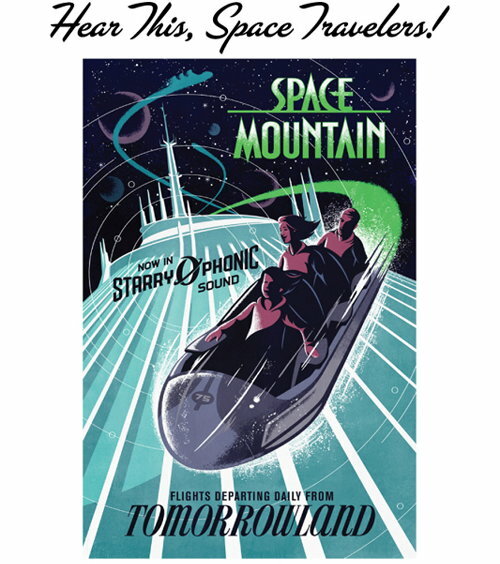 This article reviews the Space Mountain logo and art for the indoor roller coaster that is located in the Magic Kingdom at Walt Disney World Resort Florida. The other Space Mountain attractions at the other Walt Disney Parks are not covered in detail in this article. The Space Mountain logo is the logo that is displayed in front of the ride on the tower that is located in between the stand-by line entrance and the FastPass+ entrance line. The logo is colored with green lettering and has a white outline. The current logo is the same shape as the previous logo, however the color was changed to green and white. Below is a picture of the logo, displayed as the main sign. Above Space Mountain logo photo originally by Theme Park Tourist on Flickr and Wikimedia Commons. Modified by NavFile. Photo released under a Creative Commons License. A second Space Mountain logo that Disney Parks has created is the Starport Seventy Five logo. This is is displayed inside the ride at the line or queue portion. More information on the location of this logo on the ride can be found on our sign page. The Starport Seventy Five logo is primary displayed as a white colored logo on a dark background. The “seventy five” portion of the logo was put in place by the company to commemorate the opening of the ride in January 1975. Above photo of the Space Mountain Starport Seventy Five logo by Loren Javier on Flickr. Photo released under a Creative Commons License. The Walt Disney Company has created a good amount of artwork for the ride. You can see some of the art while on the ride. The company also creates some artwork for the ride that is posted on the Disney Parks blog. Below is one of the pieces of artwork that was created by the company to celebrate the reopening of the ride and the introduction of a music soundtrack on the ride. Above photo by Walt Disney World / Disney Parks. Used under the fair use provision. The logo and art for the ride has changed throughout the years. The current version of the logo was unveiled by the company in 2009 when the ride reopened after refurbishment. Before the green logo, the roller coaster had an orange color version to match the ride’s former sponsor, FedEx. The current logo has the same design as the FedEx orange Space Mountain logo. Before FedEx was a sponsor, RCA was the original sponsor for the ride and the theme and artwork for the ride was different under the RCA sponsorship. To learn more about the indoor roller coaster and the other attractions at the Magic Kingdom, please visit the other pages on the site.